The Terrasol Beach Resort in Cabo San Lucas is situated on the most southern point of the Baja Peninsula. You will wake to stunning views of the Pacific Ocean if you rent a condo on the south side of the resort. 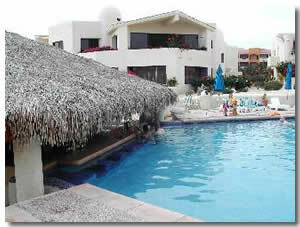 You are in a prime spot for your Los Cabos vacation right near the Marina, and the Cabo nightlife. You can also have a family plan where children under 12 can stay for free in the parents room. The condos will have a King size bed, a queen and a queen sofa. Just check before you book as the condos vary in size. If you are on a budget the full kitchen will be a blessing. You can walk into town which is about a five minute walk, get some groceries, and cook them in your condo. This can save you a lot of money as restaurant bills can soon add up. Enjoy your breakfast out on your private balcony. It's a perfect start to the day complimented with your ocean view. You have two pools to sun bath by at the Terrasol Beach Resort in Cabo San Lucas. This isn't a busy resort so you don't have any trouble getting near the pools. One has a very affordable swim-up Palapa bar where you can get drinks and snacks. You don't need much more during the day on your relaxing Los Cabos vacation. Being a beach right on the Pacific Ocean the undercurrents make it unswimmable. If you do want a swim in the sea you can get a water taxi for a few dollars that takes you to Medano Beach. That is one of the only swimmable beaches in Cabo San Lucas. It will defeat the object of your Cabo vacation though if you are after a quiet relaxing time as Medano Beach is very busy. As well as sunbathers you get the odd vendor approaching you every now and then. The beach is very peaceful at the Terrasol Resort. Plus you are walking distance from Lovers Beach. You are within walking distance of all of the nightlife, and a water cab away from the swimmable beach. This means you only need a car rental if you plan to take a drive further into Los Cabos. You will have more than enough to do at the Terrasol Beach Resort in Cabo San Lucas. If you like to relax, and you decide to drive out you'll probably end up wishing you stayed at the resort.